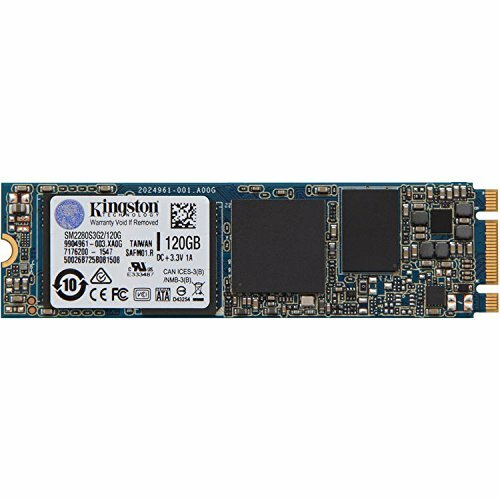 Kingston's M.2 SATA G2 SSD is a thin and compact, caseless internal solid-state drive that combines high capacity with low power consumption to serve as a reliable caching device or primary storage for the O/S and applications. Suitable for desktop motherboards that use the Intel 9x chipset and popular small-form-factor (SFF) PCs including Ultrabook's, notebooks and tablets, the M.2 2280 SATA G2 SSD easily integrates into designs with M.2 connectors and is ideal for system builders and DIY end users. Lighter weight than a cased SSD, the M.2 SATA G2 SSD optimizes performance with advanced garbage collection, wear-levelling and TRIM support to keep performance consistent over the life of the drive. DevSleep, a recent addition to the SATA specification, is an efficient power management option that minimizes power consumption and extends battery life. Firmware-based power loss protection maintains data integrity and ensures that data in the cache is constantly flushed and hardened to NAND to enable the drive to recover in the event of an unsafe shutdown. M.2 Form Factor - Multi-purpose SFF connector replaces small mSATA and mini-PCIe slots. Single-sided design - Integrates easily into designs with M.2 connectors; ideal for thin-and-light systems. Guaranteed - 5 year limited warranty and free technical support.